Part of preparing for the trip is the minimalisation of our belongings. If asked, I would have said that we didn’t have much stuff as we did a lot of downsizing 4 years ago when we left the large family home and garden and moved into the apartment. All garden equipment, outside paraphernalia and a large grand piano was sold off. However, going through all the cupboards, we still seem to have lots of stuff. The plan is to store our stuff while we are away so the quantity of said stuff will be important. The technique I have applied to the task is to do a once over sweep through each cupboard and across each surface to remove obviously no longer used or needed items. This has been quite taxing on the brain as my criteria for dismissal were: when was it last used? And, how much do I like it? The first challenged my memory and the second my emotions. If it has not been used in two years and/or I don’t really like it, the item is evicted. The next step, which I am currently conducting, is a deeper sweep with the criteria of: am I likely to use it in the next few years? And/or, do I love it? The decluttering process has turned out to be a cathartic experience for the most part but has unearthed little tendrils of guilt and dutiful ownership attached to certain items. What to do with the china that we were given as a wedding present 22 ago, have since shipped from country to country and house to house but have never used and probably never will? A few items have been jettisoned, after much agonising, leaving a strange afterglow of relief and freedom. I can actually highly recommend jettisoning the odd unloved wedding present. A few other items are still looking at me from the back of the cupboard. A large chunk of the stuff includes 2 x daughters plus their belongings. This particular ‘eviction’ will be the most difficult and I am not at all looking forward to that part, but life moves on and we can either be ‘left’, as parents are, or all leave each other at the same time. Our Trademe listing will start again this weekend as most people are back from holiday and hopefully back in a spending mood. Conversely, I have found that our desire to spend money on ‘things’ is now markedly reduced. Apart from buying specific pieces of equipment for the trip, which is finite and dependant on pulling power, there is little point in buying other stuff as it just increases the amount we need to store while we are away. So I have become very aware of everything that enters the house and whether it needs to stay, can go right back out, or needed to arrive in the first place. It is a very interesting lens to view the world through and makes you realise just how ‘stuff’ oriented the world has become. 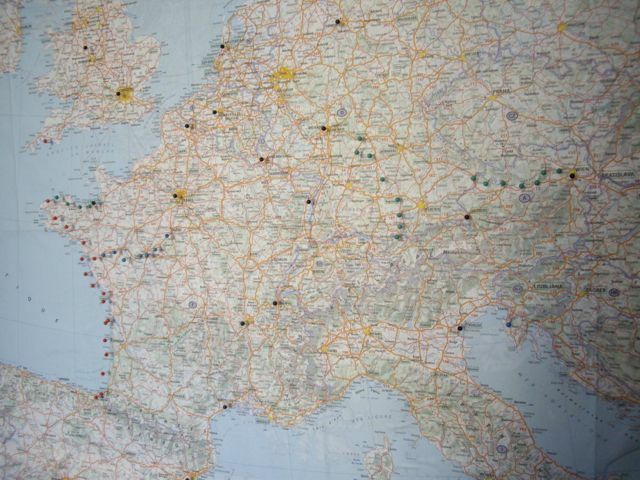 We have added a few new routes to the itinerary and have plotted them on the map. There is a route along the Danube from Passau in Germany to Vienna in Austria that sounds very nice. Vienna is a place that has a black pin (must do) in it … it is the route on the right in the image below; the one on the left is the ‘Romantic Road’. The Husband is irrationally averse to traveling in Germany (something to do with the war) but, after a quick slap, has agreed to the Romantic Road route I mentioned in my last post, plus Berlin, which I particularly want to see again (without the wall this time). We have also added part of Eurovelo route 6 to the plan. 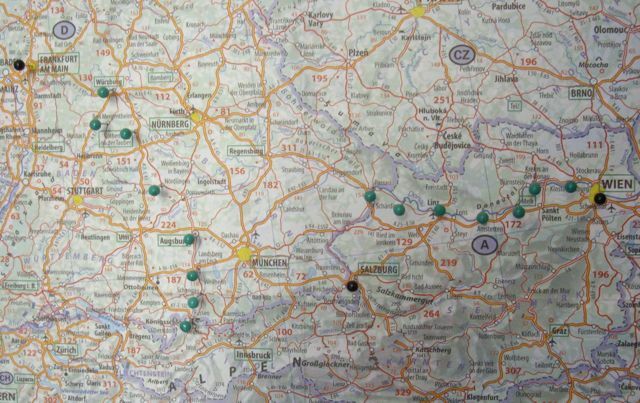 It goes along the Loire valley (blue pins below), which is chockablock with chateaux, and the Husband is particularly keen on Brittany so there will be a bit of a tiki-tour around there as well. The route in red below is part of the Eurovelo route 1 and the part in green is where route 1 joins route 4. We thought these might come in handy as it is sort of the way we want to go. The latest plan we have is to leave England and go to Paris by train and then pick up route 6 in Orleans and follow it by bike to the coast. 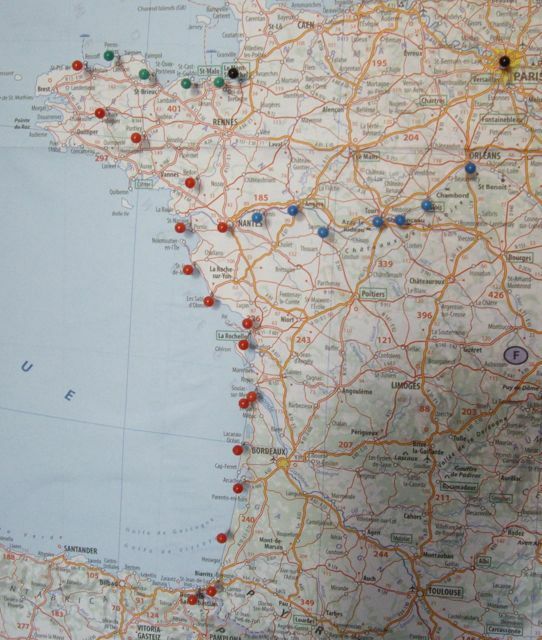 Then do a bit of a trip into Brittany and then down the coast to southern France and across to do the French Riviera. It then gets a bit more sketchy and we are thinking of heading North through France, Belgium, the Netherlands and Denmark to Sweden. Then going down again through Germany, along the Romantic Road, and Austria, along the Danube, and across to Italy (probably by train due to Alps). Then potentially across to Spain and Portugal. Apparently Portugal is cheap and we probably won’t have much money left by then. This is obviously still a work in progress. Personally, I’d avoid Portugal on a bike as I’ve found the drivers to be fast on blind corners, aggressive and generally… remarkably kiwi, but that’s personal experience and it’s possible you’ll have a different experience there. Best of luck with the decluttering and packing! @ Adam – thanks for that – good to know. We had only really put Portugal in the plan because someone told us it was cheap but it is a bit out of the way so we will probably take your advice. I also like your idea about Budapest and already follow Hungarian Cycle Chic, but had weirdly not linked the two! Thanks for your suggestions. Previous Post Electric bicycles for cycle touring in Europe?